Finding wedges that properly fit your game in terms of performance, feel, look and cost is rarely an easy thing to accomplish. Walking into a golf store leaves row after row of wedges that look similar, have a similar cost and all say something about spin and feel. One thing rarely associated with wedges in terms of performance is forgiveness and with the launch of this new Mizuno wedge line, THP was eager to see just how much that could assist golfers in their scoring game. Building upon the successful JPX iron line, Mizuno introduces the new JPX Series of high performance wedges. These JPX wedges feature Mizuno’s Quad Cut Grooves and a CNC milled face for maximum spin, and serve as the perfect extension to any of Mizuno’s JPX iron sets. The JPX wedges were specifically designed for the mid to high handicapper, featuring a cavity back design for increased forgiveness and a wider sole for more effective bounce, with a look that any golfer can appreciate. The JPX Series will deliver superior wedge performance for golfers of all abilities. Quad Cut grooves for maximum spin and ball stopping control. CNC Milled Face — increased surface roughness for improved spin on short range shots. Triple cut sole design delivers ideal turf interaction and syncs perfectly with JPX iron models. 8620 steel construction for solid feel. Two tone double nickel chrome finish. High spin quad cut grooves milled to USGA limits. When the JPX wedges arrived at THP HQ for testing, the first thoughts were that they looked quite good. While not as classically elegant as many seem to believe wedges should be designed or as minimalistic as some wedges appear, the JPX line had a clean look to them that was slightly bigger overall than most wedges that have been tested as of late. One thing that stood out to all of the THP testers that put these in their hands was that while the club head has perimeter weighting, at setup, the club still appears rather sleek and “blade like” and that was comforting from more of a “that’s what people are used to” kind of thing. Next to other wedges, you can get a sense of some extra weighting in certain areas, but on its own, on the golf course, our testing showed that most did not notice anything of the sort during use. The looks appealed to just about everybody these clubs were put in front of and testers were eager to put it in play. A company that prides and markets itself on a manufacturing process such as Mizuno with Grain Flow Forging and how it is supposed to be there to create a softer, better feeling club, our testers were surprised to see that the JPX line of wedges is produced using a casting process due to the nature of the design. More on that coming up shortly. The Mizuno JPX wedges were put in play for several months of use on the course as well as countless range sessions and it is safe to say that each time they were used, the positive impression they gave off grew even larger. With so many wedges being similar shaped and weighted nowadays and the powers that be mandating how grooves can be cut, a lot of choosing wedges comes down to subjective thoughts. Looks – Since it was touched on above, we will not dwell on it again here, but suffice it to say that the group of golfers testing these wedges very much liked the looks both from the overall package stand point, and the fact that the company has packed perimeter weighting into a wedge without sacrificing too much in terms of classic looks during use. Feel – When a company positions itself over the years as having superior feeling golf equipment due to the manufacturing process, it is hard to move past that the one area of the game where feel is so wanted (wedges) you are to overlook that. The JPX wedges are not Grain Flow Forged like much of the Mizuno line, but done via a casting process and some Mizuno purists may shy away from the clubs because of that. THP is here to tell you that you will be making a mistake if you do. This wedge line has a fantastic feel and while that is a purely subjective trait, not a single person that tried these for us during this review process thought otherwise. Weighting, balance and shape combine to give us a nice impact tonal experience that translates nicely to the hands to give off a rather full feeling wedge that offers great feedback. Shaft & Ball Flight – The JPX wedges come standard with the True Temper Dynalite Gold XP wedge shaft, however many custom options are available for golfers that have a different preference. During our testing, the shaft and club head worked quite well together to give off a nice high ball flight and traditional golf swings and still being stiff enough to maintain the touch needed around the greens for every shot needed. 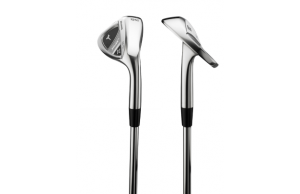 Forgiveness – Not something that is normally associated with wedges due to the classic design that most are equipped with, the JPX line of wedges offers just enough mass in the right places to assist some user error. The two areas where the club head and weighting really assisted were high on the club face where once in a while the amateur golfer will catch one due to a thick lie and out on the toe of the club. Both of these spots saw the forgiveness of the JPX wedge shine and the extra mass in the perimeter weighting really helped golfers not suffer from extra strokes when slight mis-hits occurred. The Mizuno JPX line of wedges was one of the biggest surprises our testers have come across so far this year. Great performance and solid forgiveness without much (if any) of a sacrifice in terms of feel and playability. The JPX wedges from Mizuno recently hit stores with a price tag of around $100 and can be found at a retailer near you and by checking out THP Approved online vendor Blind9Golf. For more information on this or any other Mizuno product, check out their website at www.mizunousa.com. Very awesome and detailed review here! Agree that the looks of these are still very nice and I’m surprised that these were cast colong from Mizuno. The sound of perimeter weighting is very nice because who hasn’t hit a wedge shot high on the blade at some point? 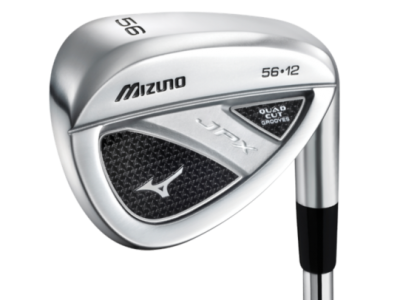 These sound like excellent wedges, and another great product offering from Mizuno! Great write up JB! I really like what Mizuno has done here in allowing the entire set to flow seamlessly from the longer irons to the highest lofted wedges. So many wedges are that standard blade look and some golfers simply need more forgiveness than that. 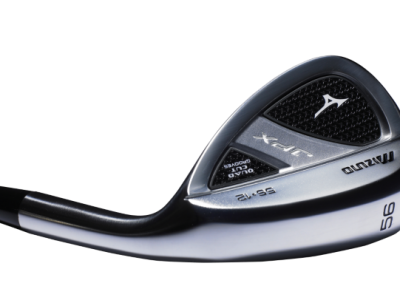 Kudos to Mizuno for putting a wedge out there with perimeter weighting that more amateurs should consider gaming. Nice review Josh, I felt the same way looking down at the wedge. You would never know it was a cavity back style. Great review and I am looking for more feedback on these wedges. I have to say that I was surprised to see these far so well in your testing, Josh. My initial thoughts were that they would be too clunky to be versatile, but your thoughts and the pictures really put that worry to rest. Definitely an option that could be very good for lots of golfers out there. The price is good too. I have to say these were a total surprise. Both in terms of Mizuno stepping up and making a forgiving wedge and how playable they are. I can see a lot of golfers being more consistent around the greens with these in their bags. I actually like the look of these. I think they are different from others on the market. I don’t think its too busy to look at. Looking forward to trying them out. One thing is for sure, there are plenty of great wedges on the market right now and these appear to be one of them. I think the price is very competitive too. Thanks for another great review JB. I wish Mizuno would offer the DG spinner as the standard shaft but I will still give these a whirl. Solid review JB! I’ve never spent too much time with any Mizuno clubs, but it’s about time that I do! Thanks for the review. Loved.the review. I am seriously considering these for my new wedges. Nice review. I love hearing the phrase Forgiving tossed into the mix. There’s a ton of competition in this segment right now and these seem to stand up to the test. Last year was dubbed the year of the driver and this year is shaping up to be the year of the wedge! I really enjoyed the review! Great write up JB. Nice to hear that the wedge still feels like the wedges people have come to expect from Mizuno even though it isn’t forged. Thanks for the info! Great review JB! How were these around the green from tight or thick lies? I can skull a chip with the best of them so just wondering how the weighting is with these. Very solid review JB, who wouldn’t love a little forgiveness, especially when it seems like it costs you nothing in return? These wedges aren’t the best looking on the market (in my opinion) but man it sure sounds like they deliver in performance and that’s all that really matters. Great review JB, I would love to hit these and test them out on the course for a round or two. I would have no problem gaming them, wasnt to big of a fan at first but now I really like the look. Nice review, JB. I’ve been waiting for this one and I’m very interested in this wedge for the AW/GW position where a little perimeter weighting forgiveness would be a plus. Wow these are some nice looking wedges. I will have to try them out next time I am at the golf store. Interesting article, JB. Definitely something to keep in mind as my next wedge purchase arises. Head looks great and heavy this will be my gamer for next season! Nice writeup JB… it’s good to hear about some wedges that can offer great feel and performance as well as a dose of forgiveness. The Golf Warehouse will sell with DG Spinner for no extra charge.